But the friend that sent me this picture assures me it’s real, and from the looks of it, I agree. So here’s a picture of the mystery billboard. So kudos to whoever put this billboard up, and keep up the awesome work! I’d like to know more information about this billboard. Who’s behind it? Why is it in English as opposed to Italian (another reason I thought it was fake.) What does the fine print say? Etc… From these stats I know a lot of people from Italy read our blog, so if you’re reading this and have some information about this billboard please fill us in! To everyone else, what do you think of this billboard? Do you think billboards like this help break some of the inaccurate stereotypes about Down syndrome? Would you like to see more of them go up? Leave a comment below and chime in! Wow, this is interesting. Thanks so much for sharing it. Can you translate Italian? I’d like to know what that article says. LOL, that’s the first thing I tied. But anyone who has ever studied a foreign language knows theres no way an automatic language translator could be accurate….. Language just doesn’t work like that. Hi, it ‘s Alessio from Florence, the father of Emanuele, 20 months and an extra chromosome! The billboard has been made by the family association of Florence called Trisomia21. This is the website http://www.at21.it already signed in the elder posts and Antonella Falugiani is the head of the association. I am not sure if billboards help the awareness or not, but my wife and I love seeing anything like this. It’s exciting because someone from our organic fraternity is up on the billboard. It is the same when we saw another one of our boys on the Care.com commercial. Now I think about, yeah, it has got to be helping raise the awareness. The website listed at21.it seems to be from a blogger named Antonella. I think they are associated with a group teatrallegria that performed on Italy’s got talent. I can’t find any videos of their performance. Using google translate, I think they had a smaller billboard taken down, so they put up this larger one until October 15th. Good luck, I’m sure you will find the blogger behind this. I’m Italian, but I live far from Florence therefore I can’t go and check if there really is. But I can reassume the article, although my English is poor 😉 The billboard was created by the non-profit organization “Trisomy 21” as a public response to an awful episode of intolerance occurred a few days ago, when a poster of their annual fund-raising event posted by the mother of a kid with Down Syndrome in the hallway of the building where her family lives was removed just two day after because some people have complained to the doorman that they could not bear to see the picture of those guys with Down Syndrome. The fine print of the billboard says that the primary purpose of the organization “Trisomy 21”, founded in 1979 by a group of families, is to promote the best possible development of people with Down syndrome and their real social integration. I think it is a huge mistake that a billboard made to spread awareness among the Italians is in English, a language different from ours, that many, but certainly not everyone (especially among those over 40) understand! I apologize for the lenght of this comment. I hope that my English is readable. Hopely the billboard would go a long way to raise awareness among the general public. Just a little over a year ago before I welcome a baby boy with down syndrome, I myself was ignorant of down syndrome and easily brushed it off. By raising awareness and giving people a chance to talk about it,, I hope people would become more acceptable and inclusive of people with down syndrome and their family members. I was in Florence this week and the billboard is most certainly still there, in English and the beautiful little girl made my friends and I smile every time we passed her picture. 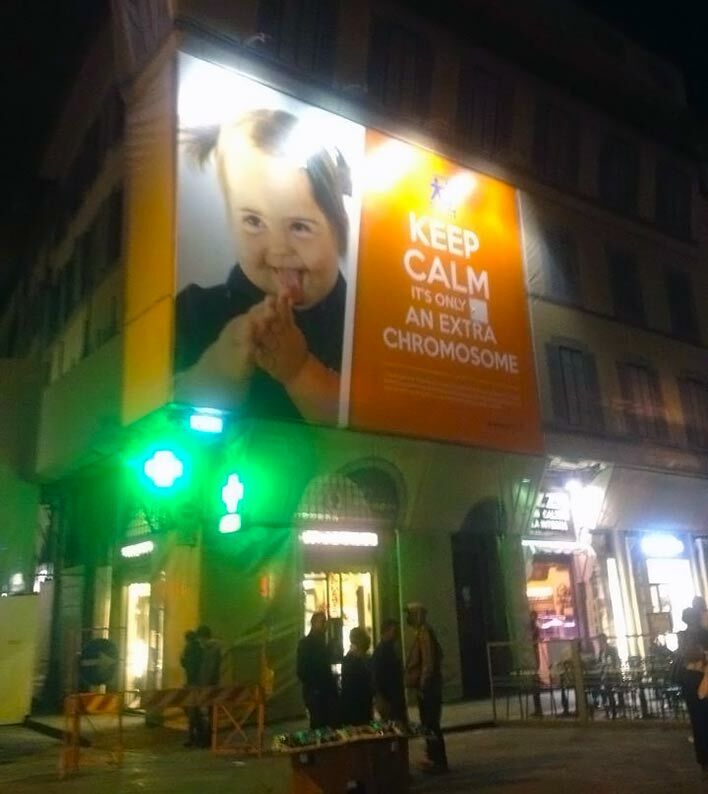 I think the billboard is a wonderful sight to see, but it is sad that the one posted in a hallway had to be taken down, It makes me wonder how shallow the Italians are in light of the fact that a DS child’s face makes them uncomfortable. Are only things of perfection acceptable to these people, because a DS child is perfection in all it’s glory and they are ignorant of the fact. I hope this organization continues in its efforts to educate the population on the beauty these children and adults impart to our world. Baba5, I agree the billboard is wonderful although it should certainly be in Italian. It is also sad that someone complained about a poster in a hallway. However I would encourage you not to think that all Italians think the same. Just as in America, there are some people who will discriminate and yes, are shallow, and there are many others who are not. The fact that an Italian organization put up this billboard and the comments by some of the Italians to this blogpost show that. Don’t label all Italians as potentially shallow because of one instance. For the record, I am an American mother of an adorable boy with Down syndrome and so far as I know, I have no Italian in my heritage. I do however hope to visit there some day. Thank you for educating me about this condition in such a straightforward, simple way. I never knew what created the condition despite having friends who’s relations have been affected by it. My husband and I saw this billboard while in Florence October 2013. I took a photo of it because we have a family member with Down Syndrome. I’ve also been wondering why it was in English and not Italian.